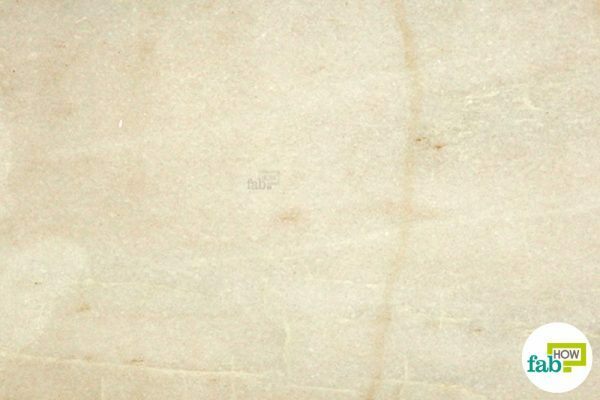 Marble installations can give any interior a touch of elegance and glamour, but the glory of this natural stone wanes fast if lacking proper upkeep. This can make one wish to have opted for an easy-to-clean tile flooring instead. 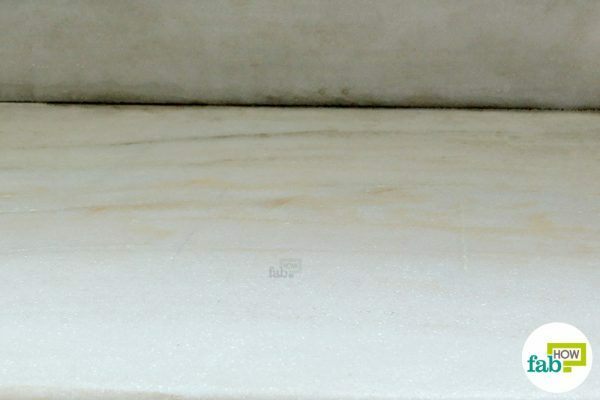 Although by keeping some simple pointers in mind, you can easily clean marble and save yourself a ton of stress involved in keeping the marble surfaces in your home in top condition. Unlike granite, marble is much softer and porous, which makes it more prone to staining as well as wear and tear. 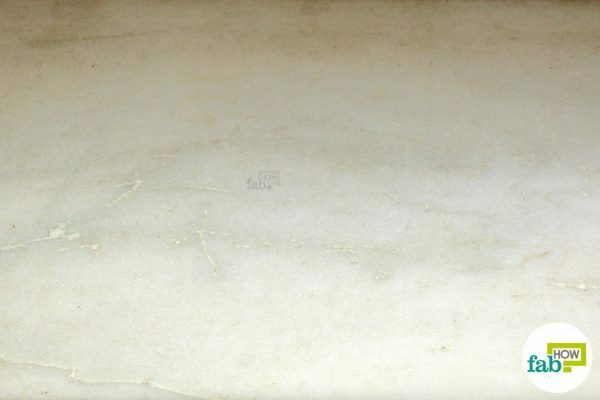 Cleaning marble surfaces the right way is very important, lest you end up with etched marble as a result of your effort to get rid of those glaring stains. 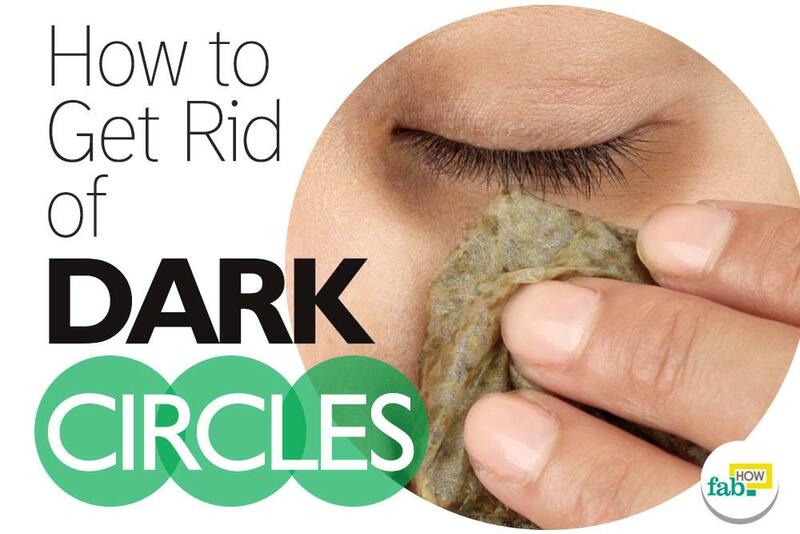 Due to the stone’s chemical makeup, all-purpose natural cleaners like lemon and vinegar must not be used. Being acidic, they react with the calcium carbonate in the marble, literally eating away at its soft surface. This is known as etching and gives the marble a dull and rough appearance. Acidic spills like fruit juice, wine, tomatoes, soft drinks and even vomit and urine can also cause etching. 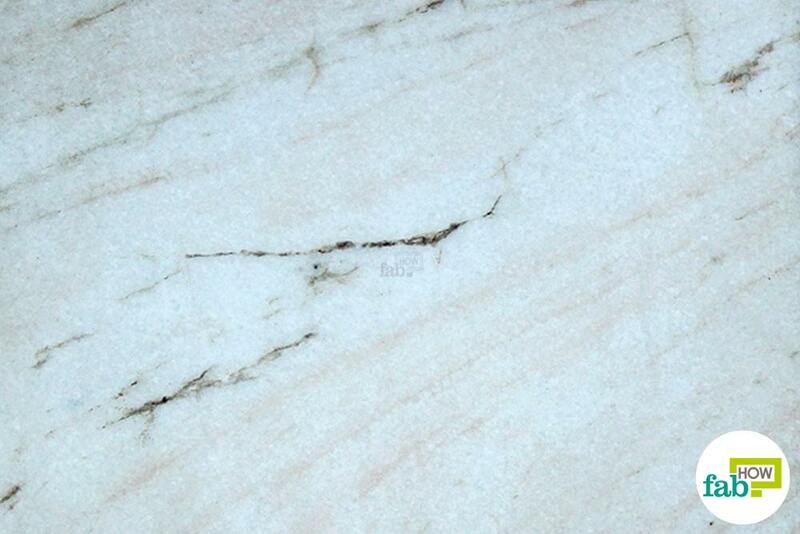 Marble is also sensitive to strongly alkaline cleaners like bleach. With many of the common household cleaners out of contention, you might consider yourself in a pickle when it comes to cleaning marble. 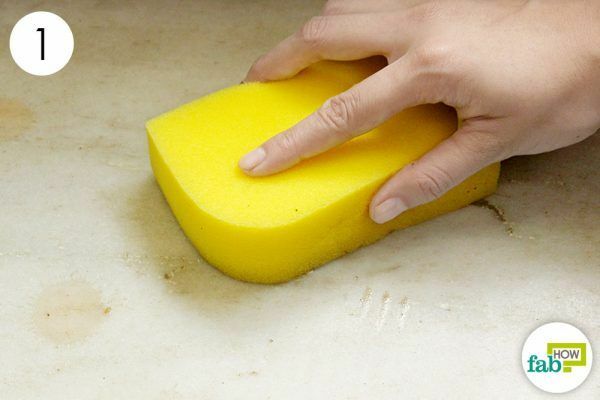 For regular cleaning, a simple wipe down with a sponge soaked in hot water should do the job. For stain removal, pH-neutral dish soap or mildly alkaline cleaners should work. Avoid using citrus based acidic cleaning agents. For deep-set stains, the ingredients should be used as a poultice to draw out the stains. The given methods offer different remedies to deal with most types of stains that find their way onto marble surfaces. 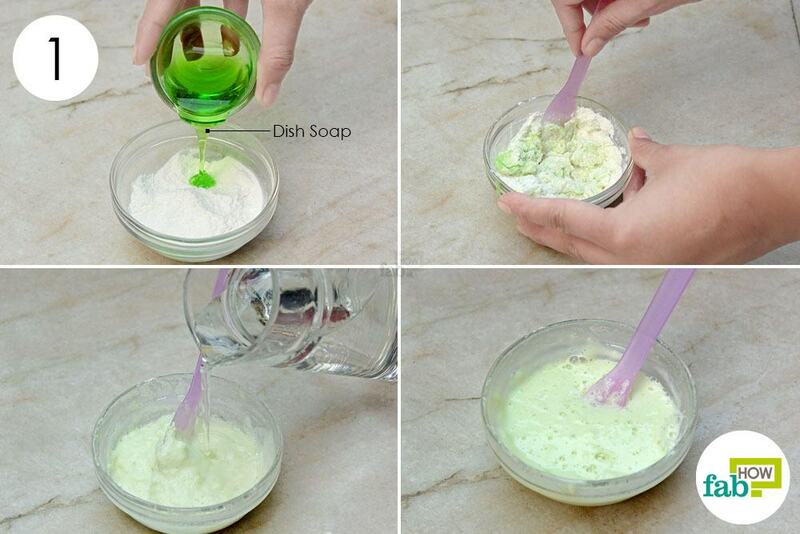 So get ready to clean marble with common household products. 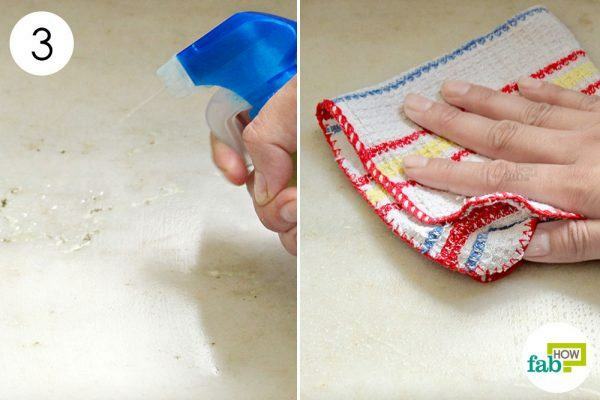 Baking soda is one of the best cleaning agents for removing stains on marble surfaces. In fact, it’s perfect for dealing with oil stains on marble. Baking soda also sanitizes and deodorizes the surface. Baking soda is mildly abrasive. But unlike conventional acidic or alkaline cleaners, it doesn’t etch the marble surface when used in the correct way. It produces effective results when used with a mild, pH-neutral dish soap. 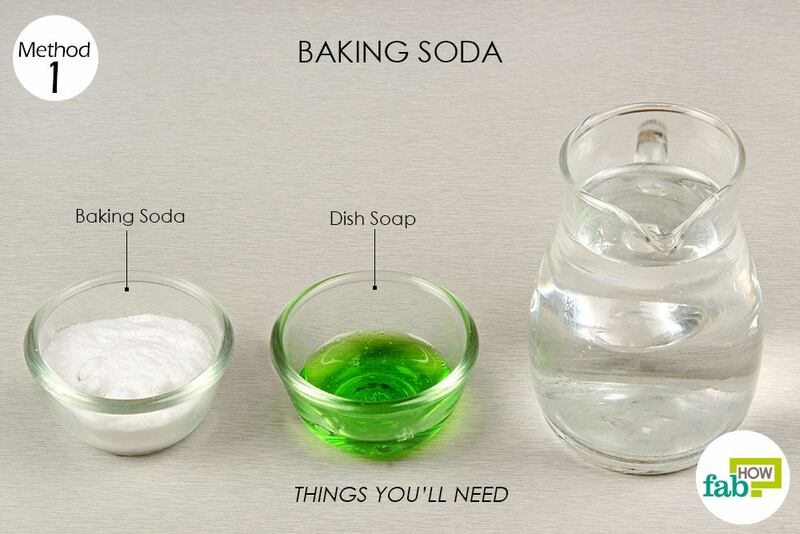 Effective as it is, you should never go overboard with baking soda. 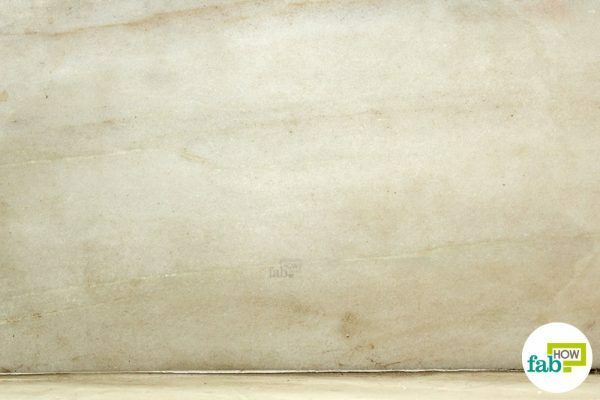 Using it once in a while can restore the look of the marble, but using it frequently can make the surface dull. 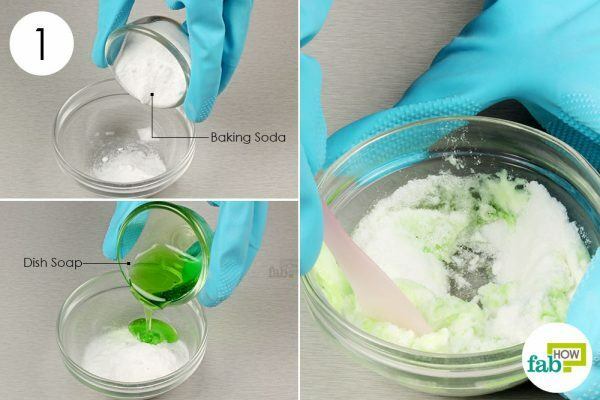 Put 2 parts of baking soda in a small bowl. Add in 1 part of liquid dish soap. Pour a little distilled water into the mixture to make a spreadable paste. The paste should have the consistency of sour cream. 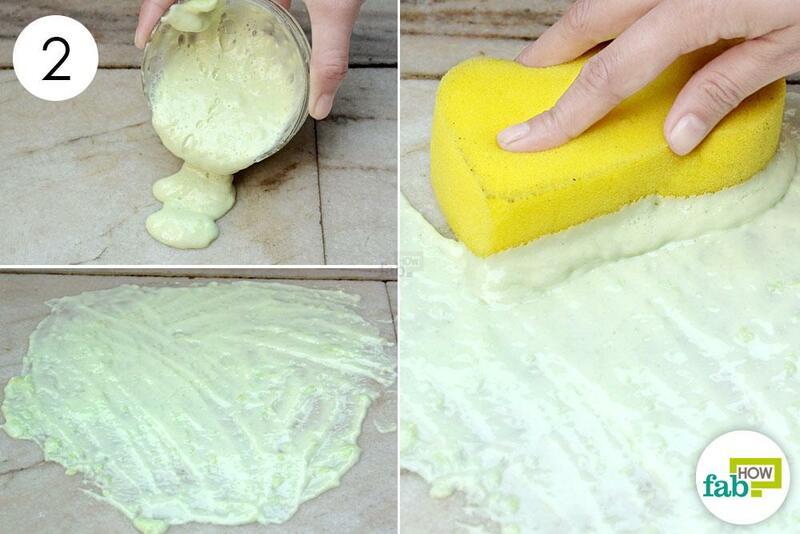 Spread the paste over the marble surface with a plastic or wooden spatula, covering it entirely. Let it sit for 12 to 24 hours, allowing it to work on the stain. 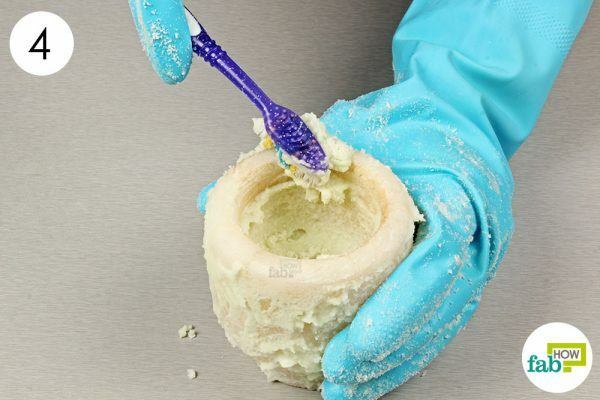 After letting the paste sit for the required time, give the marble a gentle scrub with an old toothbrush. For large marble surfaces, use a bigger cleaning brush with bristles that are soft like a toothbrush. Rinse the marble with distilled water to remove the baking soda and dish soap paste. Marble countertops or other flat surfaces should be flushed with distilled water, and wiped with a soft cloth to remove the cleaning agents. 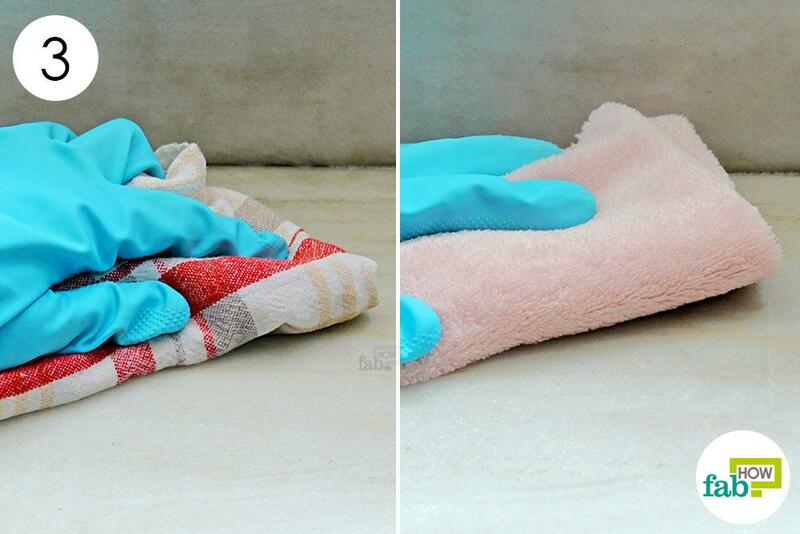 Promptly dry the clean marble with a soft towel. 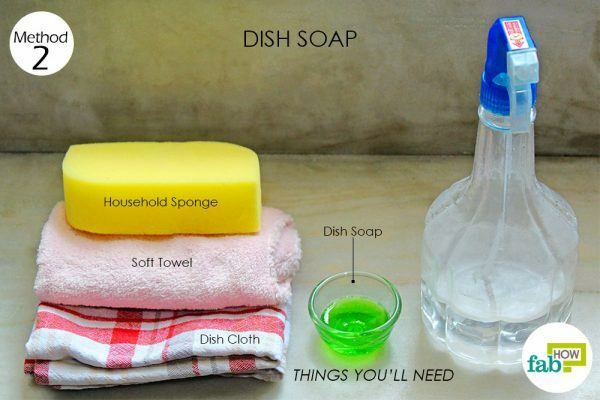 Dish soap is a versatile household cleaner that can cut through a variety of stains and grease marks, while also deodorizing and sanitizing. 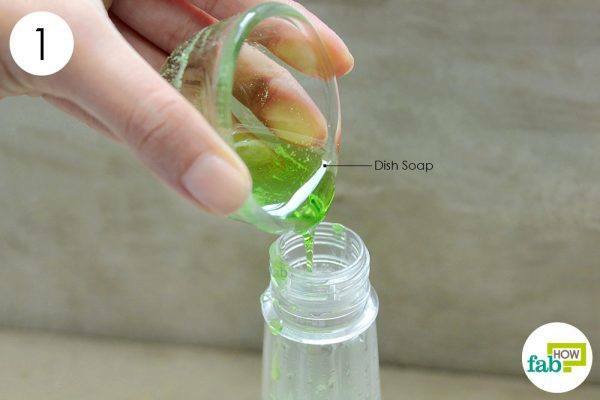 You may use liquid dish soap to clean marble surfaces, provided that you use one that’s mild and pH-neutral. Add 1 tablespoon of pH-neutral liquid dish soap to 1 cup of hot water in a spray bottle. Put the nozzle back on and give it a few shakes to dissolve the soap. Spray the hot soapy solution on the dirty marble surface. 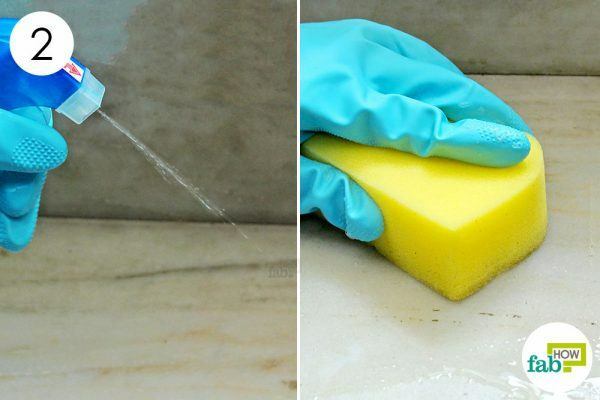 Scrub the marble with a soft household sponge. The sponge will lift up the grime loosened by the hot soapy water. Once the soap has done its work on the marble, wipe the suds off the surface with a dish cloth soaked in warm to hot water. 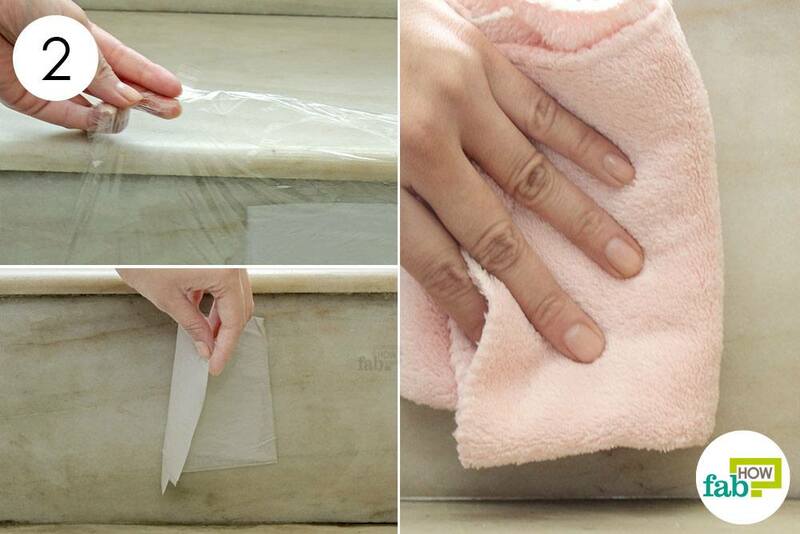 Dry the marble with a soft towel instead of letting it air-dry to prevent water stains. Hydrogen peroxide comes into play when you’re dealing with organic stains like tea, coffee, fruit, tobacco, leaves or bark, food, urine and bird droppings. The mild bleaching action of hydrogen peroxide makes it suitable for stain removal on marble surfaces, especially light-colored surfaces. Using it as a poultice is the best way to go, as the poultice will lift the stains right up. You’ll need to be careful with using it on dark-colored marble, as it may lighten the color. Do a spot test or use acetone to clean dark-colored marble surfaces. 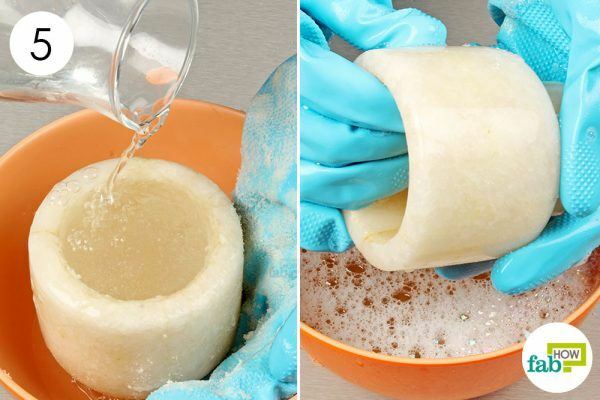 You can also use it to clean aluminum kitchen ware. 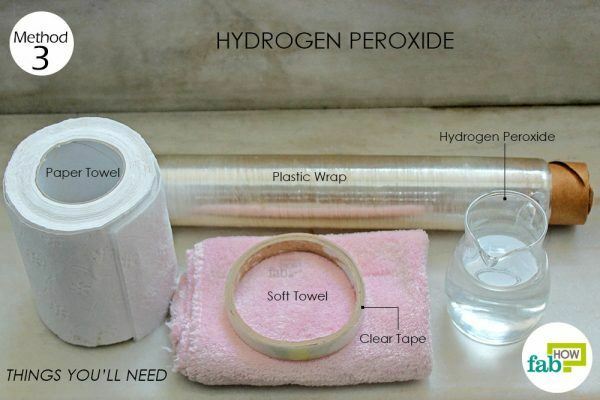 Pour hydrogen peroxide onto a folded paper towel to soak it completely. Let the excess liquid drip off, as you don’t want it trailing beyond the stained area. 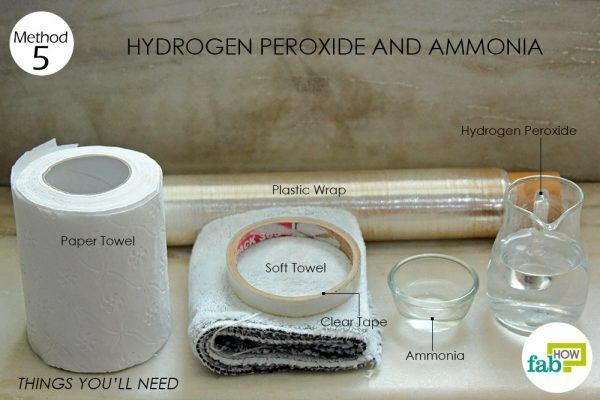 You can do this over a bowl to reuse the hydrogen peroxide. Cover the stained area with the soaked paper towels. Use as many as required to completely cover the stain. Cover the poultice with plastic wrap, then secure it with clear tape. Let it sit undisturbed for 24 to 48 hours. Remove the poultice after the required time. You may notice the stain absorbed onto the paper towels. Wipe the surface with a soft towel. If the stain has lightened but still remains, repeat the entire process. You’ve probably used rubbing alcohol to remove deodorant stains from clothing. 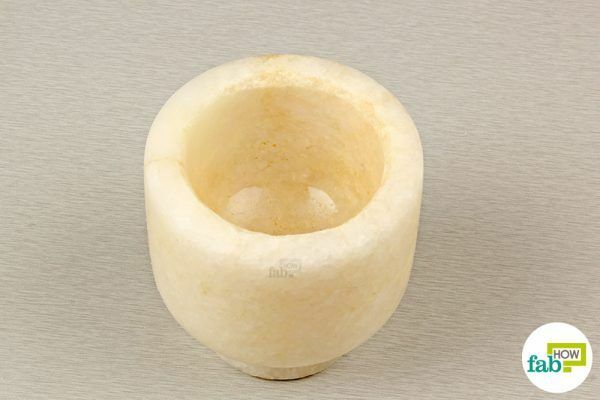 So if the marble is stained with urine, blood or any other biological fluid, rubbing alcohol will not only remove the stain but also sterilize the area. 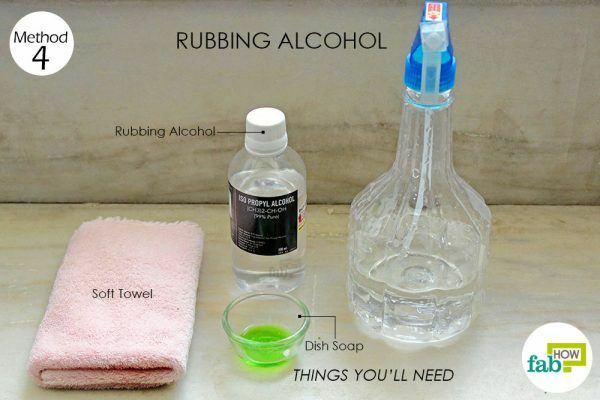 Rubbing alcohol also comes in handy for disinfecting marble flooring, since you can’t use bleach on marble surfaces. A simple solution made with rubbing alcohol and a pH-neutral dish soap can act as an effective cleaner. Add 2 tablespoons of rubbing alcohol and 1 teaspoon of pH-neutral liquid dish soap. Close the spray bottle and give it a few shakes to thoroughly mix the contents. Spray the cleaning solution on the stained marble surface. Let it sit for about 5 minutes before wiping it off with a soft towel. If you’re dealing with particularly tough stains like copper stains, a mixture of hydrogen peroxide and ammonia may be the solution. This mixture can also be used to treat biological stains like those caused by algae, mildew, moss, lichens or fungi. 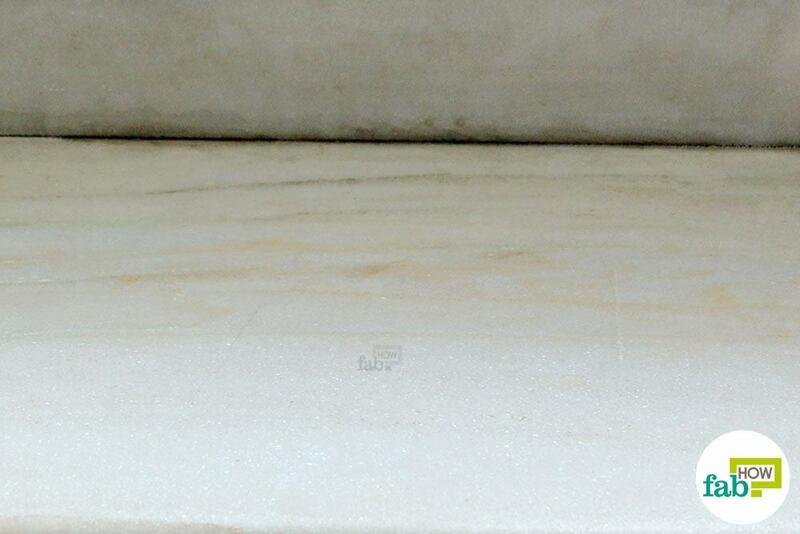 Thus, this solution is particularly good for marble installed in a bathroom, near a kitchen sink and in other damp places where mold and similar stains are most likely to appear. 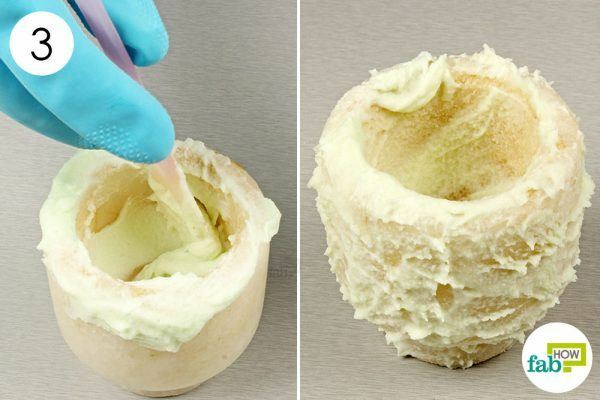 You may use the mixture as a spray, but a poultice method provides the best results. 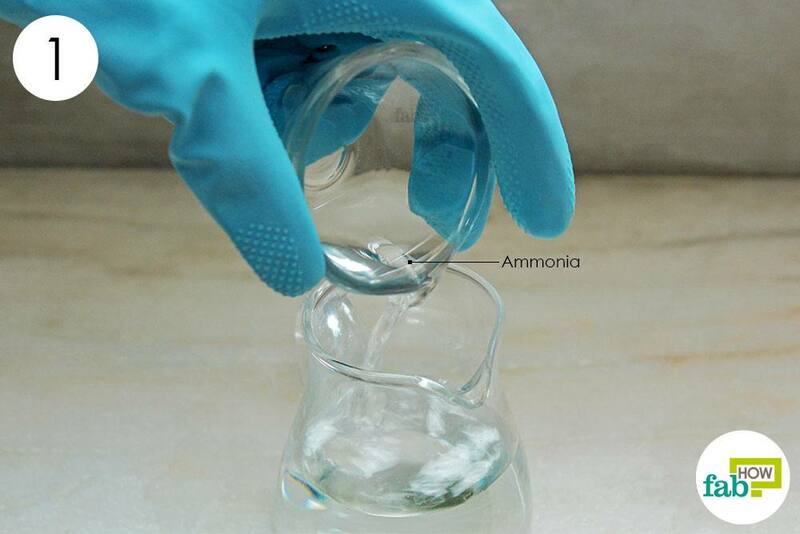 Add 1 tablespoon of liquid ammonia to ½ cup of hydrogen peroxide and mix thoroughly. 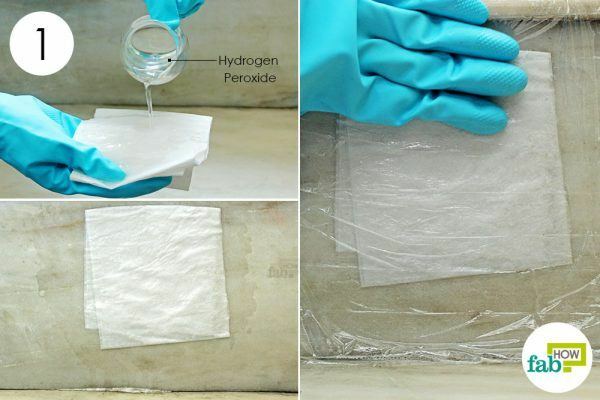 Pour the chemical solution on a folded paper towel to soak it completely. Place the soaked paper towel over the stain. Uses as many as you need to cover the entire stained area. 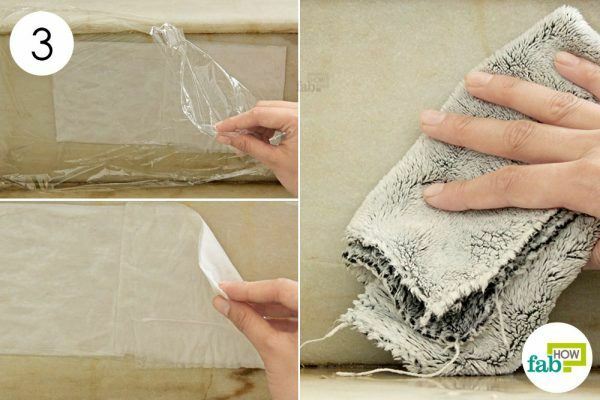 Cover the paper towels with plastic wrap and secure it with clear tape. Let the poultice sit for 24 to 48 hours. Pull off the clear tape and remove the plastic wrap and paper towels. Wipe the area with a soft towel. A paste made with flour and dish soap is a simple solution using common ingredients that can be used to clean dirty marble surfaces. 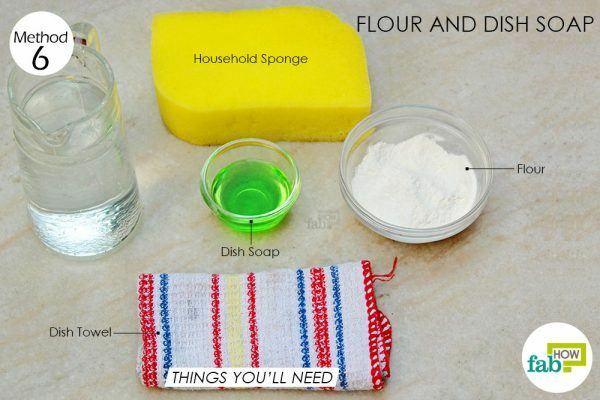 While making this cleaning paste, use unbleached flour and a pH-neutral dish soap. Dish soap cuts through old dirt stains in yellowing marble surfaces and flour readily absorbs the stains. Flour also acts as an abrasive agent and helps to buff the marble surface, giving it a shine. Similarly, flour can also be used to remove tarnish from copper. Add 1 teaspoon of pH-neutral liquid dish soap to ¼ cup of unbleached flour. Add a little water to make a paste with the consistency of sour cream. Let it sit for about 24 hours before scrubbing the area with a household sponge. Rinse the area with distilled water and wipe it clean with a dish towel. Repeat the process until all the cleaning agents are removed from the surface. 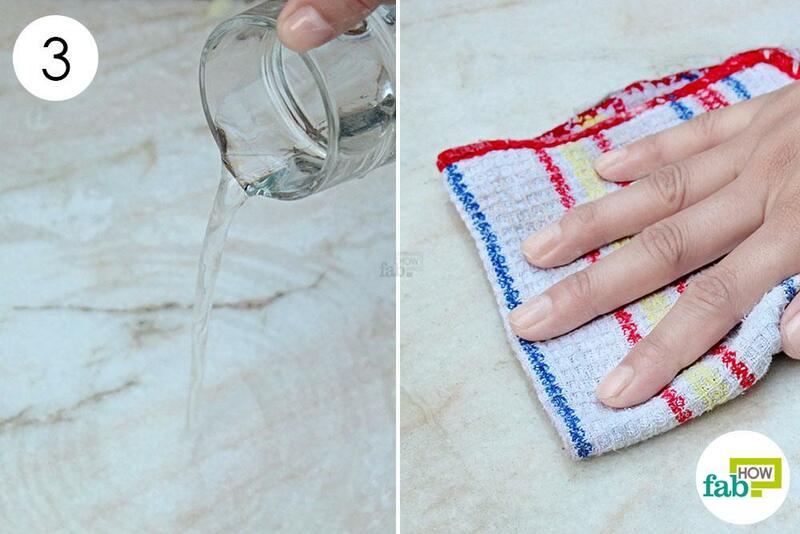 Dry the marble surface completely with a cloth. Corn starch, a common kitchen item that can be used for lifting stains from a variety of surfaces, also comes in handy when cleaning marble. It works especially well with grease and oil stains, absorbing them and preventing them from setting into the porous stone. 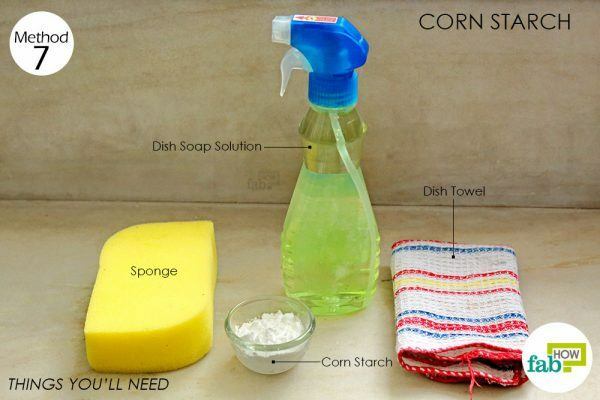 Corn starch also works as a fabulous deodorizer, so if there’s an odor that you can’t quite place, go for corn starch. Use a mild dish soap solution for a complete cleanup job. 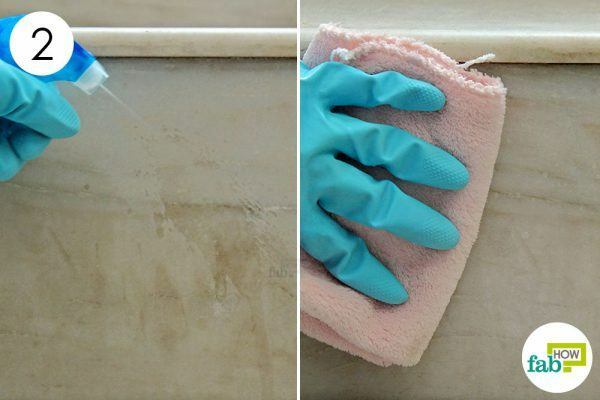 Wipe the stained marble surface with a damp sponge. Sprinkle corn starch over the stain and let it sit for about 24 hours. After 24 hours, use a household sponge and scrub away the stain with the corn starch. 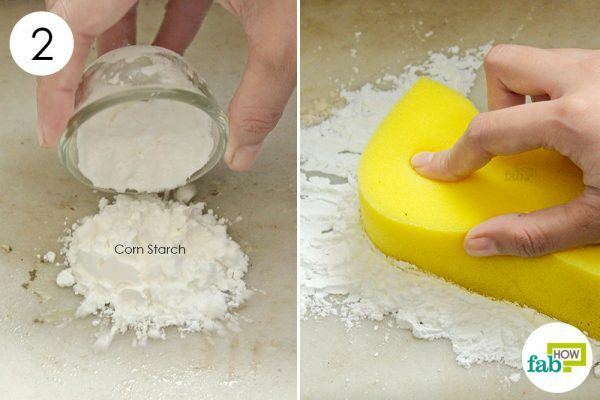 Wipe all the corn starch off the surface with the sponge. 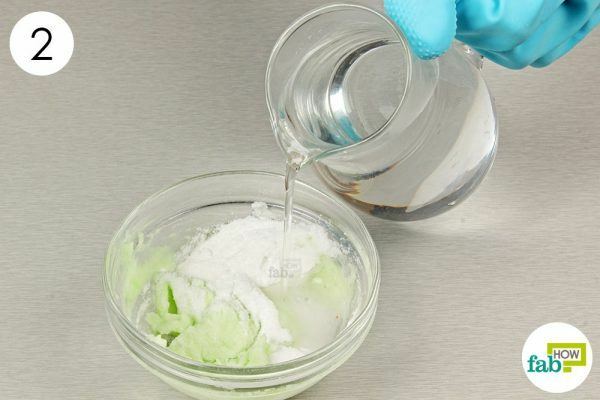 Mix 1 teaspoon of mild, pH-neutral dish soap into 1 cup of distilled water to make the cleaning solution. 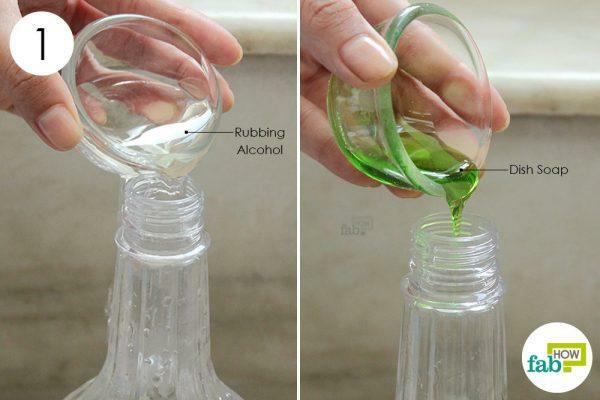 Transfer it into a spray bottle. Spray the soapy solution over the area. Wipe the area clean, then dry it with a soft dish towel. Clean up any spills as soon as possible to prevent stains from setting in and reduce the chance of etching on the surface. Wear cleaning gloves while working with chemicals to protect your hands. Before using any of the remedies, do a spot test in an inconspicuous place like the underside of a marble tabletop. If there is any discoloration or damage to the finish, try another method. Use coasters and placemats to prevent staining on marble tables, countertops, kitchen islands and other marble surfaces. 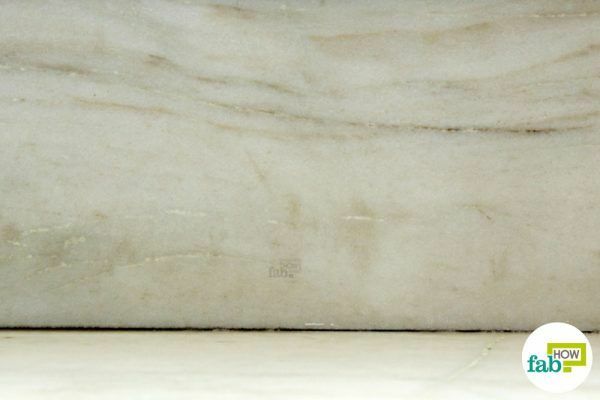 To protect marble flooring, use rugs in high traffic areas and place pads under the furniture to prevent scratching. Coarse steel wool and harsh scrubbers should not be used to clean marble surfaces. They’re too abrasive for the soft stone. Poultice applications can be repeated up to 5 times on a stained area. Poultice material should always be white. If you don’t have paper towels, you can also use cotton balls and white gauze as poultice material. Make sure that the poultice applied to the marble surface is ¼- to ½-inch thick. It should also cover an extra inch around the entire circumference of the actual stain. You can also remove the plastic wrap from the poultice after 24 hours and allow the poultice to dry on its own before finishing the cleanup. Etches can be smoothed and buffed out with sandpaper. Start with coarse-grit sandpaper and work toward finer grit as you go. Thanks so much for these helpful instructions. Do let us know how it turned out for you. 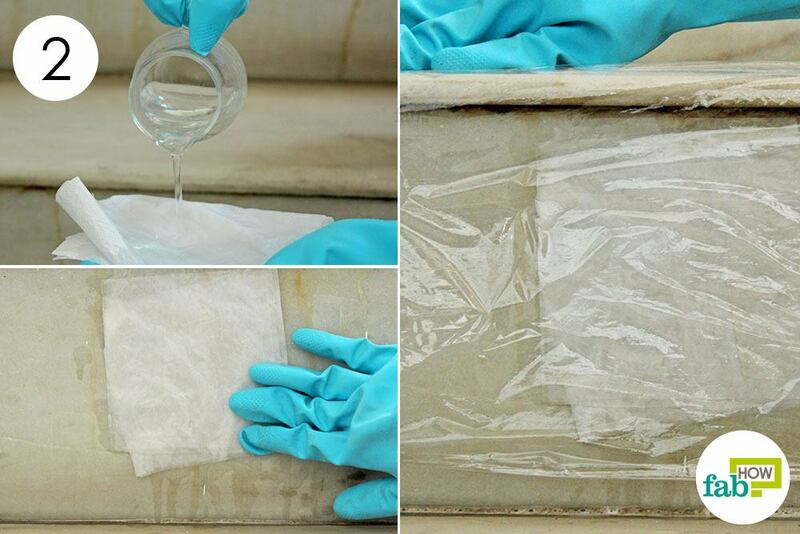 Do you know the best method to get an old rust stain out of white marble? Is it even possible? You may try covering the stain with baking soda and pour lemon juice over it after a few minutes. Let it sit for a while and then scrub it gently with a soft brush. The stain will lighten after a few times of application over time.